Virgin Australia Holdings Limited (Virgin Australia) (ASX: VAH) today reported a Statutory Loss After Tax of $83.7 million. Financial performance for the first half of Financial Year 2014 was impacted by the challenging trading and competitive environment; ongoing subdued consumer sentiment and economic uncertainty; the effect of strong market capacity growth and the unrecovered $27.0 million cost of the carbon tax. 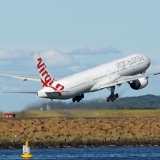 Virgin Australia Chief Executive Officer John Borghetti said: “The result reflects the tough trading conditions across the entire industry for the first half of Financial Year 2014. The Australian aviation market continues to be impacted by the significant capacity growth which occurred during the 2013 Financial Year, compounded by weak economic conditions and the inability to recover the cost of the Carbon Tax. Consequently, the Australian domestic aviation industry has made a first half loss for the first time in 20 years. “However, Virgin Australia continued to increase its proportion of domestic revenue from the corporate and government market segment and outperformed its main competitor on the key measures of growth in Total Group Revenue, Domestic Yield, International Yield and Group Revenue Load Factor. “We remain on track with our consistent strategy and have delivered on all the first-half targets around Velocity Frequent Flyer, global market access and customer experience. “Our business efficiency program continues to progress towards the target of $400 million in cumulative productivity gains for Financial Year 2015. We have also identified several additional cost saving initiatives, over and above this program, to be implemented over the next three years. “Several major strategic initiatives essential to ensuring a successful and sustainable business model were executed during the first half. At the same time, we continued to consolidate our positioning across all key market segments, including further expanding our regional network and enhancing our strong partnerships with leading global airlines, bringing significant benefits to the Australian consumer. “Virgin Australia has progressed with the integration of Skywest, continuing to align resources, systems and processes, and has worked closely with joint venture partner Tiger Airways Holdings Limited (Tigerair) to improve the performance of Tiger Airways Australia Pty Limited (Tigerair Australia). "During the first half, Virgin Australia restructured its balance sheet through a number of successful initiatives including an Enhanced Equipment Note offer and Share Entitlement Offer. Consequently the business now has an improved balance sheet, providing additional flexibility and resilience. “I am confident that we are on track with our five-year Game Change Program strategy to create a business that can deliver sustainable performance for the long-term, through its positioning as an effective competitor in all key market segments”, Mr Borghetti said. “Total Group Revenue increased 5.6 per cent on the first half of the 2013 Financial Year, including the additional revenue associated with the acquisition of Skywest. “Domestic Yield growth was slightly positive for the first half of the 2014 Financial Year compared to the prior corresponding period. “Interline and codeshare revenue grew strongly during the first half, increasing 25.3 per cent on the prior corresponding period. The introduction of SabreSonic drove a significant increase in the number of our international points of sale this half. “The Skywest business was acquired in April 2013 and we are beginning to see some positive results. Skywest’s charter revenue increased 45.0 per cent during the first half of this Financial Year compared with the prior corresponding period , in part because the regional business can now access Virgin Australia’s Boeing 737 fleet for charter use. We intend to continue to grow our regional and charter business aggressively. “Consistent with expectations, Skywest remains on track to be earnings accretive from Financial Year 2015. “Virgin Australia acquired a 60 per cent interest in Tigerair Australia during the first half, with its share of equity-accounted losses amounting to $18.4 million. Tigerair Australia’s load factors, Revenue per Available Seat Kilometre (RASK) and aircraft utilisation have all increased compared to the prior corresponding period. “International revenue decreased compared to the first half of the 2013 Financial Year in the context of strong competition. We continue to improve our international business through optimising our alliance partnerships and further enhancing our own product and service offering. “Virgin Australia incurred several non-recurring costs during the first half as a result of the recent balance sheet initiatives, the completion of strategic investments and the optimisation of the business platform. Initiatives undertaken to restructure the balance sheet comprised a significant portion of these costs. The company also incurred costs as a result of the acquisition of Skywest in April 2013, including the transition of Skywest to the same SabreSonic system as Virgin Australia in August 2013, the migration of the business to the “VA” designator code and the alignment of systems and processes. “Comparable Unit Cost growth including fuel, foreign exchange and the impact of Skywest increased 4.5 per cent on the prior corresponding period. This growth was driven by a number of factors including lower Available Seat Kilometre (ASK) growth, investment in customer experience enhancements and higher distribution costs to support increased corporate and government passenger revenues. We remain highly confident that the investments in both our improved distribution systems and product and service enhancements will yield returns over the coming period. However, the impact of difficult trading conditions and an aggressive competitive environment has resulted in a longer than anticipated lag in realising the benefits of our investment, putting greater pressure on revenue growth. “As mentioned, we remain committed to retaining a significant cost advantage over our main competitor and have identified several key initiatives which are expected to deliver cost savings over and above the business efficiency program. These include renegotiation of supplier contracts, increased fuel efficiency initiatives, deeper pursuit of cost savings through leveraging the scale of our international alliance partners and an improved productivity drive across the workforce. “The company’s performance was again impacted by the carbon tax, the cost of which ($27.0 million) could not be recovered due to strong competition in the market. “Virgin Australia operates a successful Australian dollar designated hedging program, providing a large degree of short term certainty and longer term participation and protection, with strong gains compared to current market conditions. 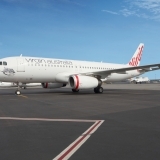 “Virgin Australia recorded normalised capacity growth of 1.4 per cent across the domestic network (excluding Tigerair Australia) for the first half of the 2014 Financial Year. We now have a strong, domestic network covering 47 destinations and will continue to focus on our strategy to optimise yield through the effective and dynamic management of our network. Given the competitive environment we will not provide a capacity forecast going forward. “We continued to improve our On Time Performance (OTP) during the first half, narrowing the gap between Virgin Australia-branded operations and our major competitor’s branded operations to just over 1 per cent and outperformed our major competitor in the month of January 2014 ”, Mr Borghetti said. “As at 31 December 2013, both our total cash and unrestricted cash balances were at record levels for the first half, with a total cash position of $896.4 million and an unrestricted cash position of $665.4 million, up $315.9 million and $338.9 million respectively on 30 June 2013 balances. Operating Cashflows were also positive for the first half of the 2014 Financial Year. “In October 2013, Virgin Australia successfully entered the international debt capital market with the issue of Enhanced Equipment Notes, a first for an airline in the Asia-Pacific market. The issue was more than three times oversubscribed at a competitive weighted average coupon rate, demonstrating strong levels of interest in Virgin Australia globally and confidence in our strategy. “In November and December 2013 we completed a $351.5 million Entitlement Offer, which received strong support from shareholders. “Through initiatives such as these, our balance sheet has been enhanced and our liquidity has improved, creating a more flexible and resilient business. 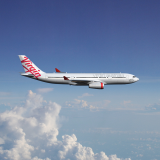 Virgin Australia remains focused on improving its unrestricted cash balance and continues to review ways to utilise resources more effectively and efficiently”, Mr Borghetti said. “Significant restructuring and transformation initiatives have now been completed and we are now focused on optimising the strong platform we have developed over the first three years to develop a sustainable business model. “The implementation of SabreSonic in January 2013 has significantly improved access to global markets, expanded the airline’s interline and codeshare revenue potential and enhanced the customer experience. “This has helped to drive increased penetration in the higher-yielding corporate and government market segment and we expect it will continue to strengthen our revenue mix and have a positive impact on returns. “Optimising the benefits of the enhanced platform has enabled the airline to greatly improve mobile and self-service capability and drive online sales growth. As a result of the re-design of the Virgin Australia website, we now have the fastest major airline website in the country. “In August 2013 we launched a new and innovative flight upgrade bidding system called UpgradeMe Premium Bid, enabling customers to submit bids for upgrades to Premium Economy or Business Class. This was a first for an Australian airline and has driven new benefits through increased revenue and the exposure of more customers to the premium ground and in-flight customer experience”, Mr Borghetti said. 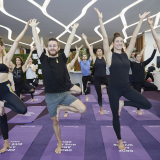 “This month Virgin Australia was recognised as Domestic Business Travel Airline of the Year for 2013 by Roy Morgan , leading the industry in business customer satisfaction for the first time. This is a major achievement for the airline and reflects the successful execution of our Game Change Program strategy. “Enhancing and expanding our lounge network has been key to improving our offering to business travellers. We recently completed a major expansion to our Melbourne lounge, which will double in size and feature a number of innovative service elements. During the first half of Financial Year 2014 we opened new lounges in Cairns and Perth, we completed the expansion of our Sydney lounge and transitioned to the Tom Bradley International Terminal in Los Angeles, giving our customers access to new state-of-the-art facilities and a new airport lounge in one of our key international hubs. 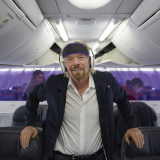 “Virgin Australia continued to innovate the in-flight experience, with the roll out of our wireless in-flight entertainment technology to our Boeing 737 fleet. This had an immediate impact on customer satisfaction with in-flight entertainment which increased 27.0 per cent following commencement of the roll-out in August 2013 . We also conducted a major overhaul of our flight catering model, increasing its relevance to specific customer groups and making it more cost-effective”, Mr Borghetti said. “Following strong growth in the first half of this financial year and continued improvement to the value proposition of Velocity Frequent Flyer, membership now exceeds 4 million. “We continue to see growth across all key metrics and we are confident of achieving our target of 5 million members by the end of the 2015 Financial Year. “Velocity added over 70 new retailers to the program during the half, including Priceline, Sony and Net-a-Porter and maintained the widest retail offering of any loyalty program in Australia. This month Starwood Hotels and Resorts was added as a major new partner, enhancing the program’s appeal to the corporate traveller. “In the last six months, Velocity Frequent Flyer was recognised with a range of awards, including Best Frequent Flyer Program, Best Redemption Ability and Best Elite Program in the region at the 2013 Freddie Awards. Our new Global Wallet card won the Travel Card Innovation of the Year category at the 2013 Mega Awards and was recognised at the Loyalty 2014 Awards for Best Use of Technology by a Loyalty Program”, Mr Borghetti said. “Virgin Australia further expanded its extensive domestic and international network during the first half of the financial year. “Domestically, we introduced a new service between Melbourne and Hamilton Island, bringing Business Class to that route for the first time since 2004. “Internationally, we added 11 new codeshare destinations and increased frequency from Sydney, Melbourne and Brisbane to Denpasar in Indonesia. “Virgin Australia’s strong relationships with global airline alliance partners, Air New Zealand, Delta Air Lines, Etihad Airways and Singapore Airlines are critical to the ongoing success of the company”, Mr Borghetti said. “Virgin Australia continues to bring competition and choice to regional Australia and has become a key partner to the resources industry. We have grown our regional operations through increasing charter contracts and launching services on new and existing routes. “In October 2013, we introduced services between Perth and Paraburdoo in the Pilbara region of Western Australia, bringing competition to the route for the first time. This followed an increase in services between Perth and Karratha as a result of strong demand from the mining and resources industry. On the east coast we commenced flights to Cloncurry in November 2013 and added additional frequency to Bundaberg and Moranbah in January 2014. “The expansions in this half year reflect Virgin Australia’s commitment to regional Australia. Since 2011 the airline has also brought competition to an additional six destinations, including Emerald and Mt Isa. “We intend to continue to grow regional services strongly on the east and west coasts, with a minimum of six additional ATR-72 turboprop aircraft scheduled for delivery by the end of the 2015 calendar year”, Mr Borghetti said. “In the first six months of the joint venture with Virgin Australia, Tigerair Australia’s operating performance has improved across a range of metrics when compared to performance during the first half of the 2013 Financial Year. Aircraft utilisation increased 12.7 per cent, load factors improved 4.7 points to 88.0 per cent and Revenue per Available Seat Kilometre (RASK) increased. This has been achieved whilst maintaining a low cost base and delivering improvements to On Time Performance (OTP) in late 2013. Tigerair Australia’s OTP result was 80.4 per cent for the month of December 2013. “Tigerair Australia plans to launch a base in Brisbane in March 2014, enabling it to address the underserved budget market in Queensland and realise further network synergies. “The goal is to ensure Tigerair Australia remains an effective and sustainable competitor in Australia’s budget travel market segment”, Mr Borghetti said. “Our people and the service they deliver remain our core differentiator in the market. “In the first half of this Financial Year we continued to invest in growing and developing our people. Some of the major growth initiatives included launching our first cabin crew base in Adelaide, graduating the first year of Virgin Australia pilot cadets and introducing a new engineering apprentice program. “We also continued to enhance the capability of our people and their engagement with our strategy, through leadership development, targeted training and on-the-job learning and a new integrated approach to performance management. “In October 2013, Virgin Australia was recognised for the third consecutive year for its achievements in service excellence at the 2013 Customer Service Institute of Australia Awards. “Thanks to our team’s tireless dedication and passion for the airline, we have transformed and restructured the Australian aviation market and are on track to deliver on the next phase of our Game Change Program strategy. “I would like to express my sincere gratitude for the hard work of our people, which has allowed us to continue to bring much needed competition during a period of challenging economic conditions and aggressive competition. They will continue to drive our success moving forward”, Mr Borghetti said. “During the first half of the 2014 Financial Year, Virgin Australia has focused on consolidating its position as an effective competitor in all key market segments. As part of this, several major strategic initiatives have been executed, including restructuring the balance sheet, completing strategic investments and leveraging our new business platform. Given the infancy of these initiatives and the tough operating and trading environment, we are yet to see their full impact. “Over the next 18 months, we will focus on optimising the business for consistent and sustainable performance. This will be achieved through accelerating efficiency and productivity initiatives, both internally and through leveraging the scale of our alliance partners, fast-tracking penetration into higher-yielding market segments in order to grow yield, continuing to lead the Australian industry in customer experience and creating value through our customer loyalty program. “Given the uncertain economic environment we are unable to provide guidance for the remainder of the 2014 Financial Year at this time”, Mr Borghetti said.